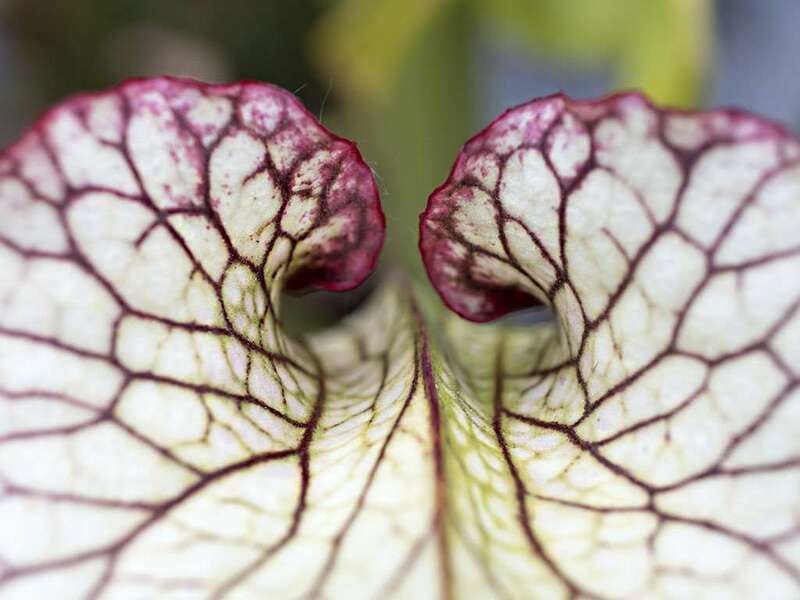 Sarracenia ‘Leah Wilkerson’ has the go-go-gadget pitchers of the naturally occurring Sarracenia hybrids. 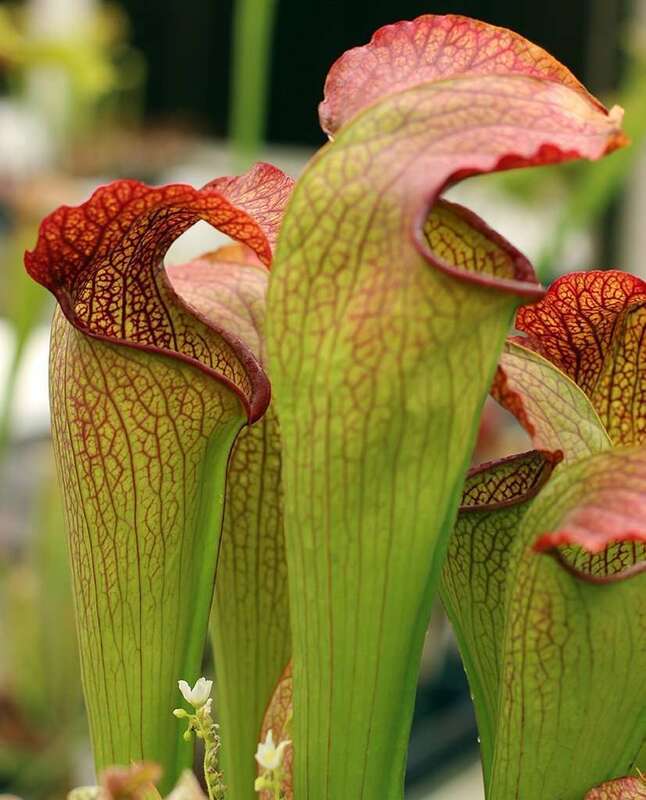 The plant’s largest recorded pitchers are more easily measured in units of Godzilla than inches, coming in at 50 inches (130cm) tall. 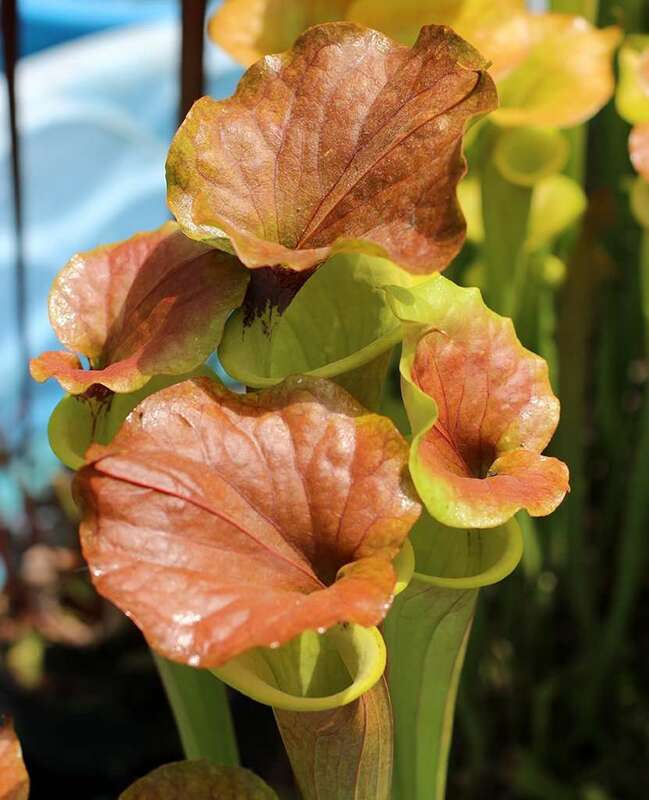 Average pitcher height is a still-ridiculous 36 inches (91cm+) with hoods of 6.5 inches (17 cm), making S. ‘Leah Wilkerson’ easy to spot over the hoods of other similar S. x moorei hybrids. 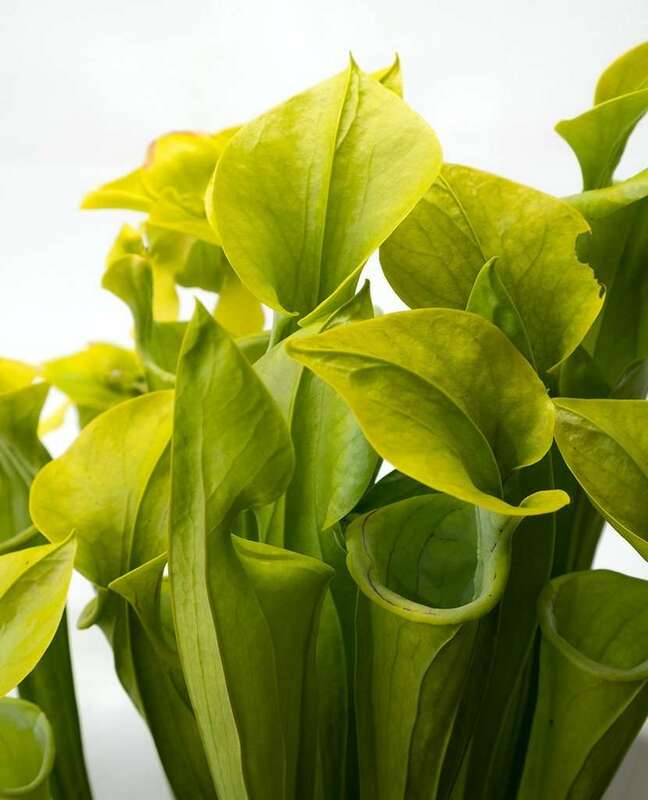 Yes, S. ‘Leah Wilkerson’ is a humble S. flava and S. leucophylla cross, but with exceptional heterosis or hybrid vigor (the improved or increased function of any biological quality in a hybrid offspring). 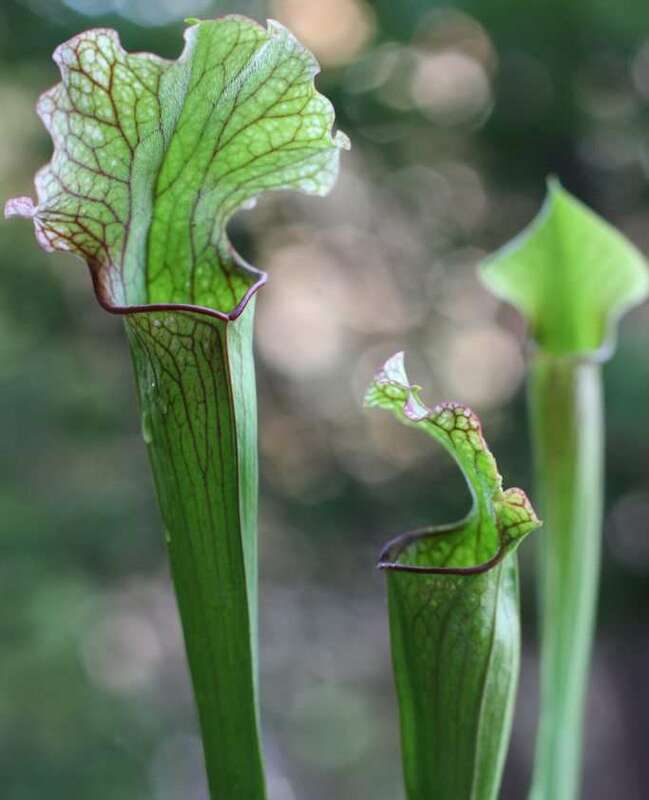 Sarracenia ‘Leah Wilkerson’ was stumbled upon in May of 2002 while visiting a bog on private property in Walton County, Florida. 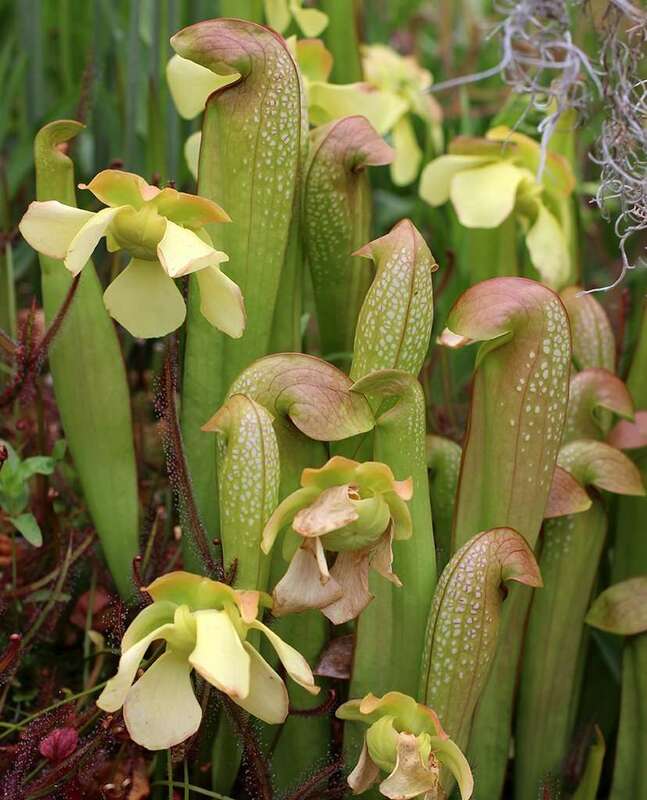 The wild mother plant was easy to spot because of its 50+ towering pitchers, and diameter of over 6 feet (2m) across. 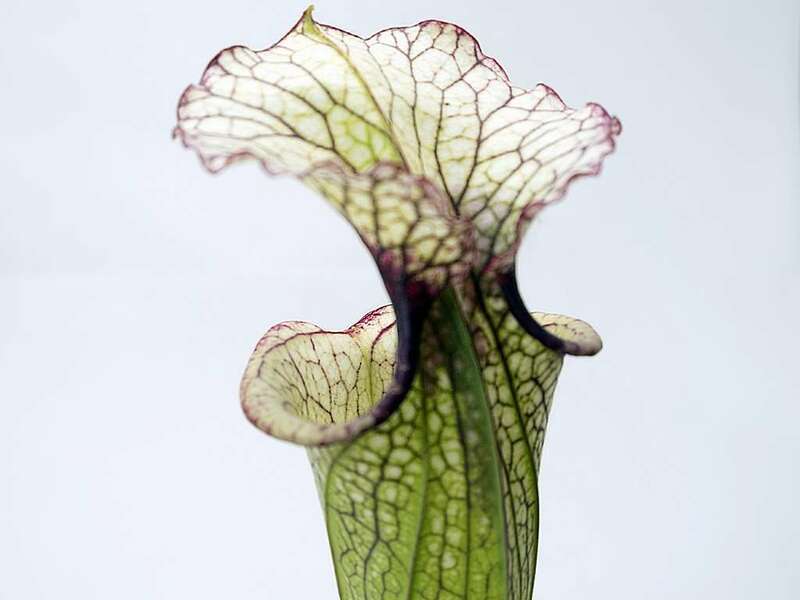 It is a gorgeous hybrid, and a prize in any collection. 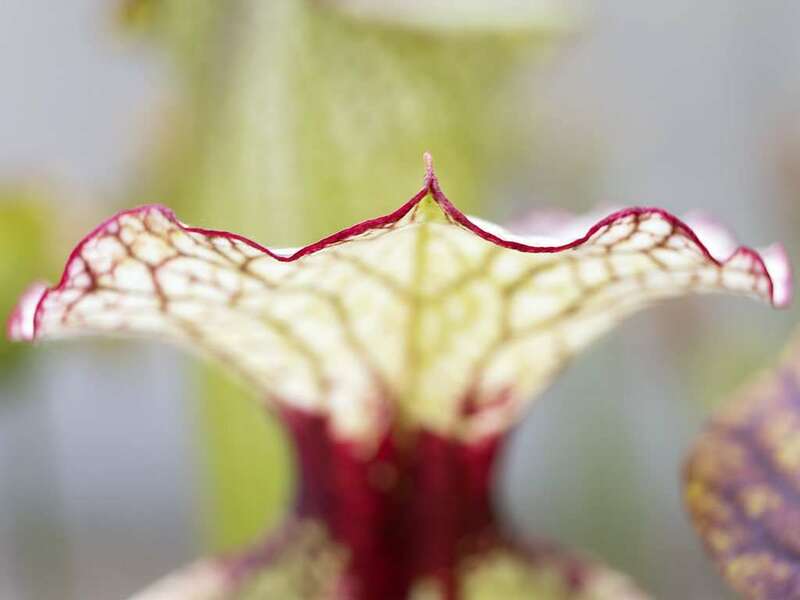 Size isn’t the only thing Sarracenia ‘Leah Wilkerson’ has going for it. 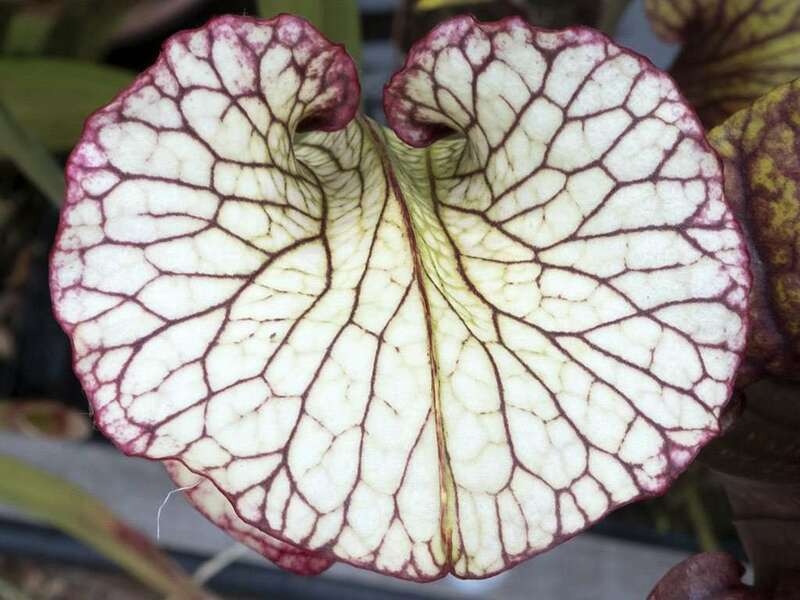 Gorgeous shades of green, red, and white coloration is another fabulous trait of this hybrid North American pitcher plant. 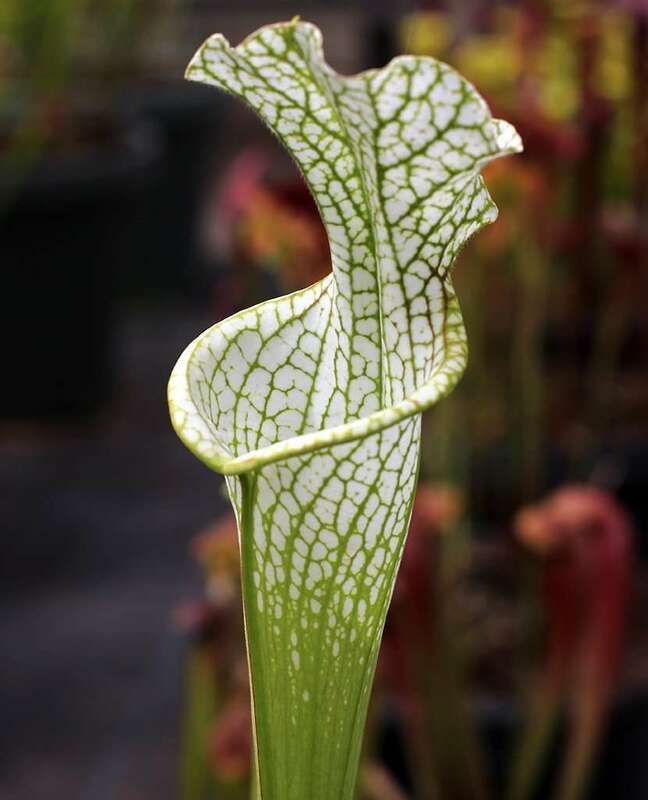 Pitchers shift from lime green at their base to a lemon green at their lid, suffused with heavy white splotching typical of the S. leucophylla parentage. 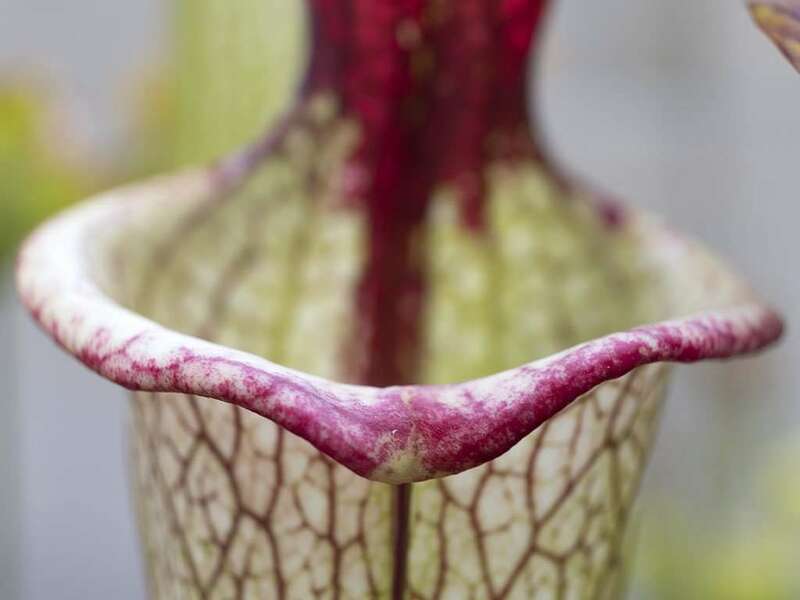 Woven through the white and green pitcher tops are beautifully intricate pink and red veins. 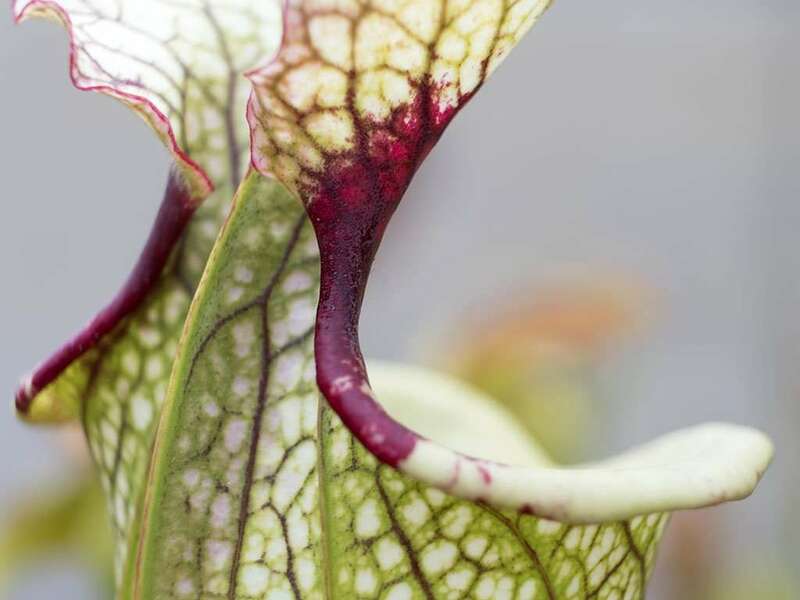 Red venation terminates at lid’s end, highlighting the ruffled lid edge with a thin margin of red all the way around. 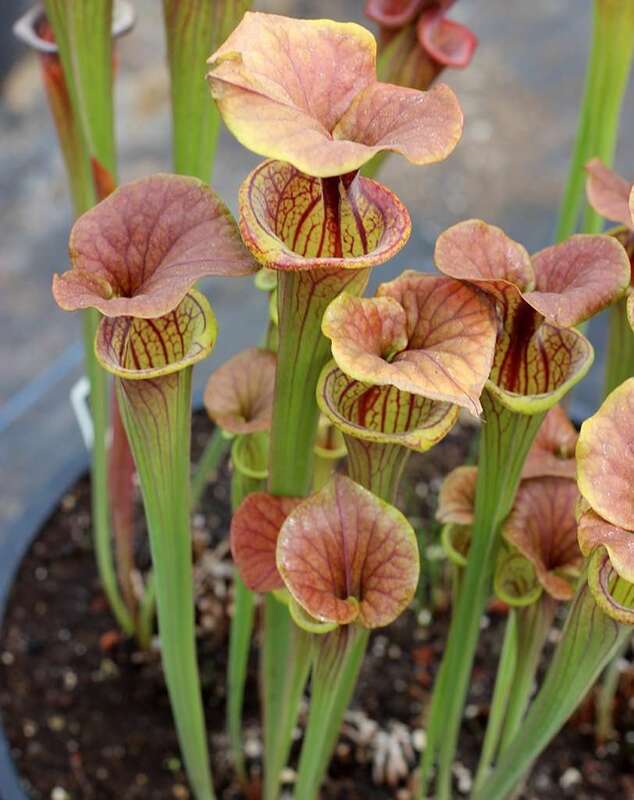 S. ‘Leah Wilkerson’ has a deep red, pronounced throat blotch indicative of it’s S. flava var. 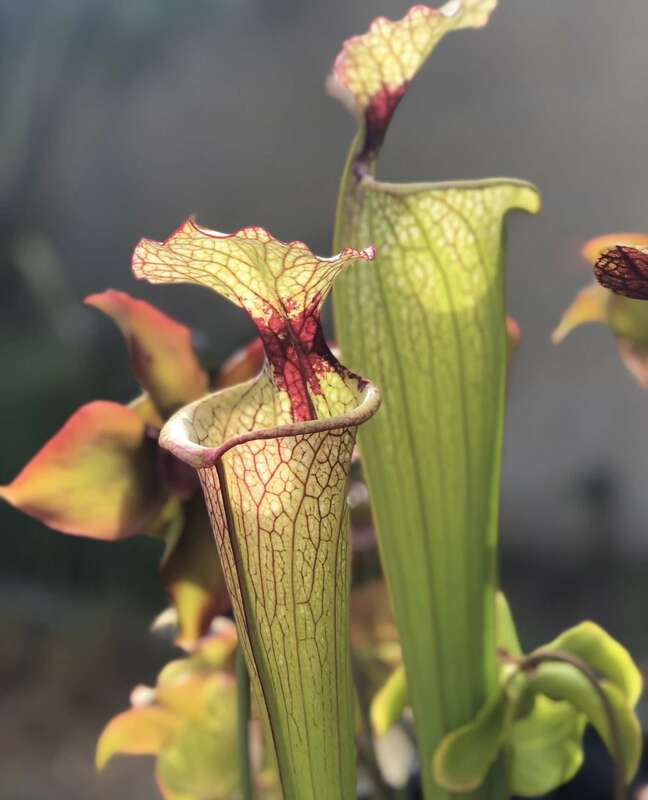 rugelii lineage that I’ve witnessed literally dripping in nectar. 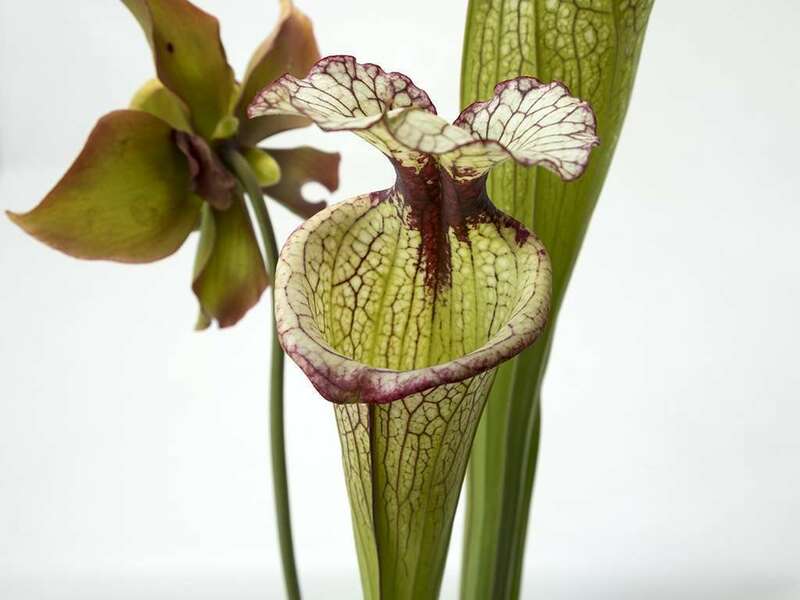 It narrows off and tapers down into the pitcher, as if to lure insects ever deeper. 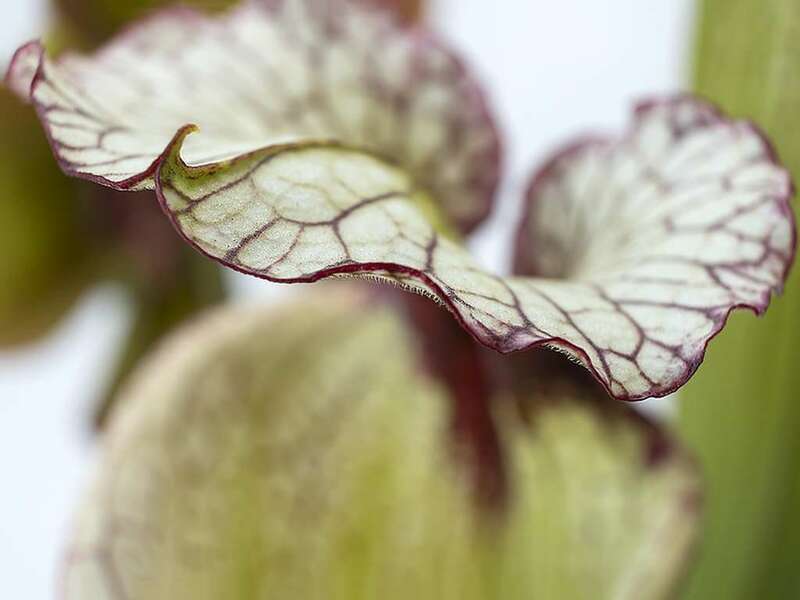 The Sarracenia flava parentage results in spring-heavy pitcher production, followed by a quiet growth period, and finally a second bouquet of pitchers in fall prompted by S. leucophylla. 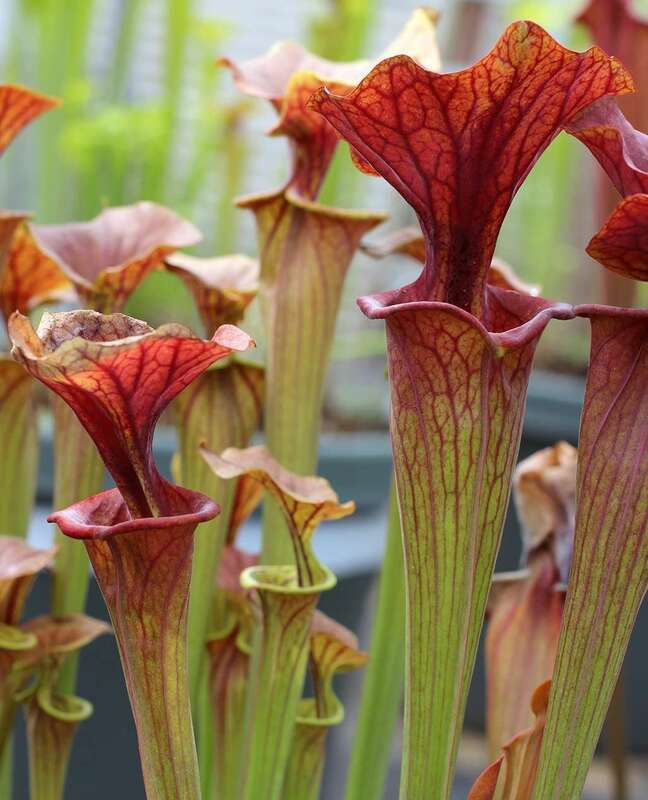 Fall pitchers tend to be largest. 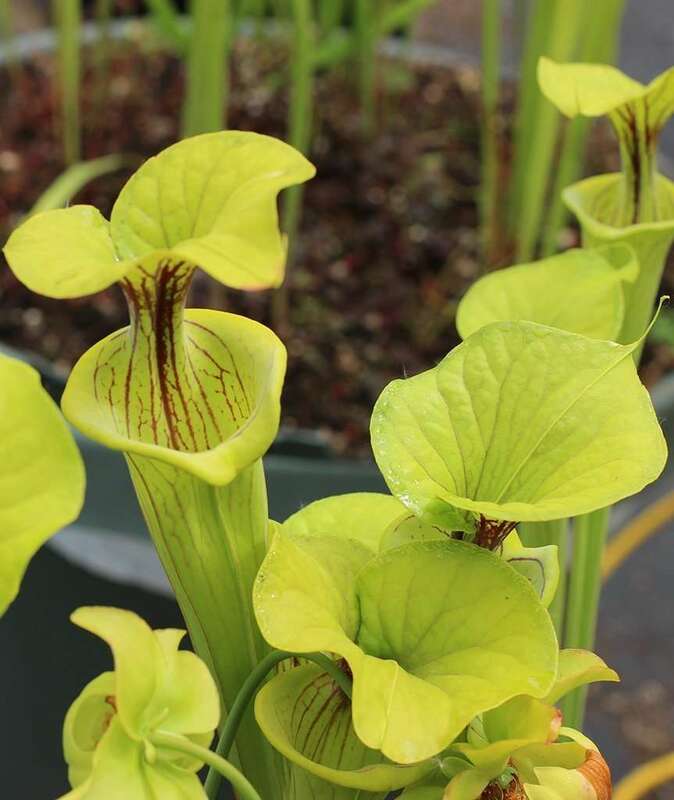 The name ‘Leah Wilkerson’ is in honor of Mrs. Leah Wilkerson who lived on the property where the plant was discovered and has maintained conditions ideal for the growth of native Sarracenia. 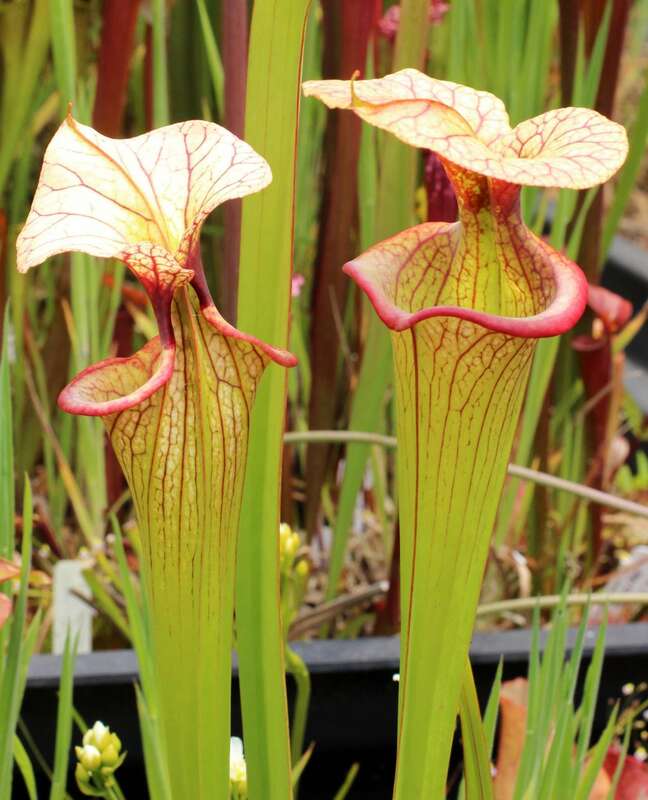 Much of this property is bog, the typical habitat for wild pitcher plants. 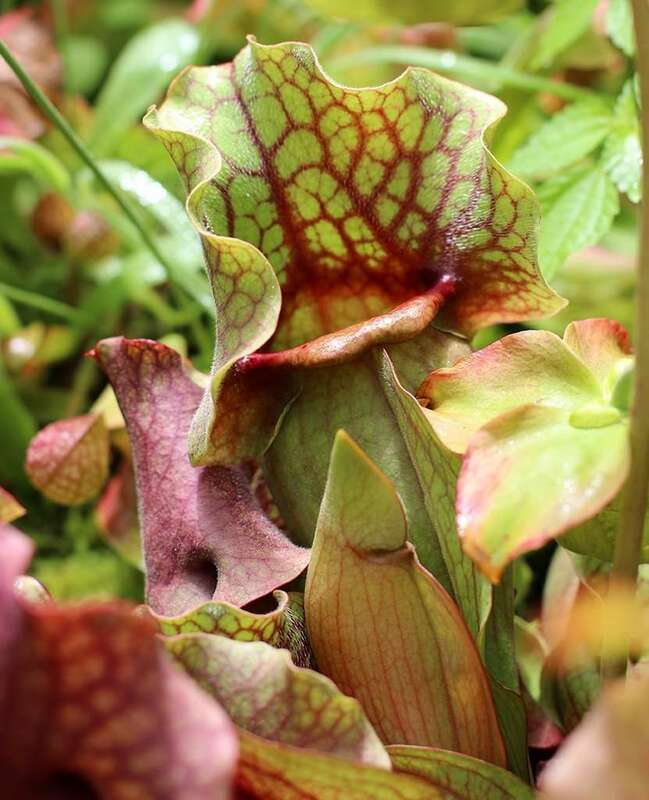 It has been in Mrs. Wilkerson’s family for generations, and controlled burns conducted by the family every winter mimics natural occurrences and reduces grass overgrowth. 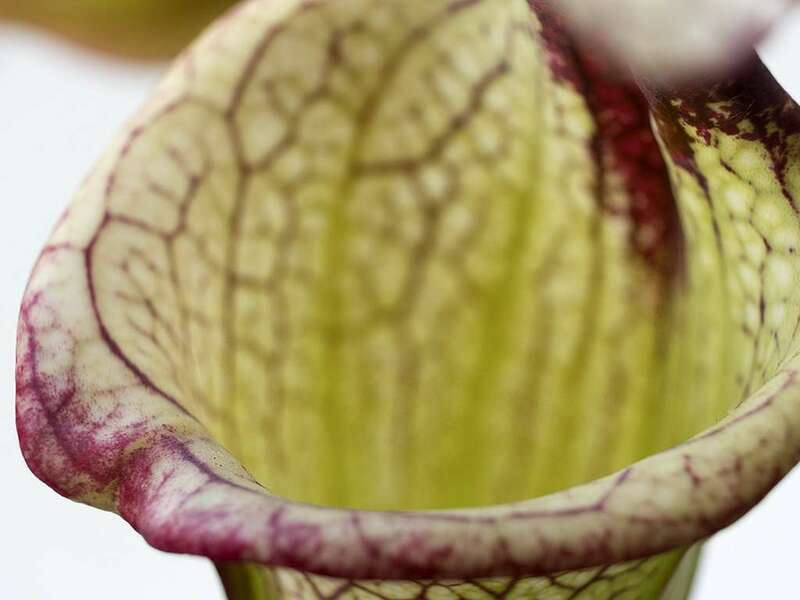 Doing so both prepares the land for livestock, and provides perfect conditions for native plants like Sarracenia to thrive. 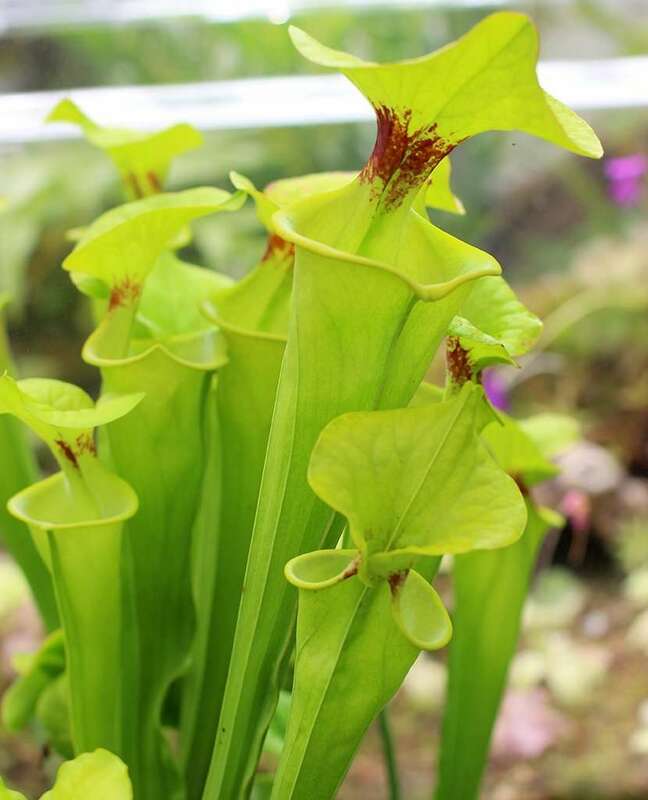 After obtaining written permission to do so, Brooks Garcia collected samples of the plant and introduced it into cultivation through a tissue culture lab. 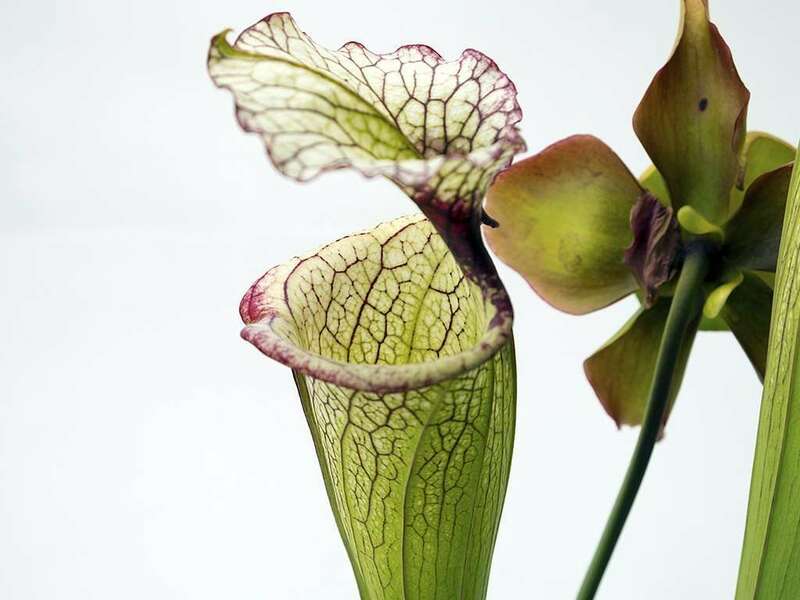 Because it is a unique hybrid, vegetative propagation via divisions is require to maintain traits of the original plant and perpetuate its lineage.